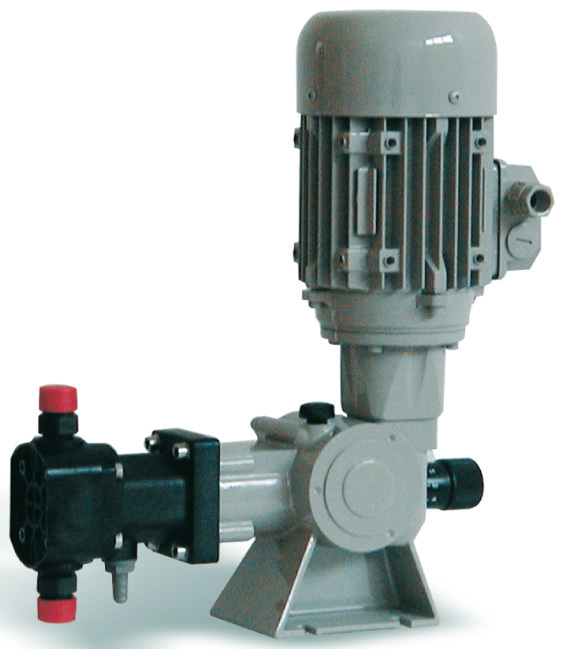 Each pump is fitted with a standard gearbox reduction system and with a vertical mounted B14 shaped electric motor in accordance with UNEL-MEC specifications. The motor power range is from 0.18 Kw up to 0.37 KW as the European standard: 3 phase voltages of 230/400V @ 50/60Hz, 4 pole and 1 phase voltages of 230/50/60 Hz or 110/60 Hz. As motors conform to UNEL-MEC specifications, there are many available alternative options, including different voltages, insulation classes and special explosion proof versions. The reduction gearbox is of a standard endless screw plus worm-wheel type, supported by bearings, fully lubricated in an oil-bath. The mechanism for the variation of the stroke spring return type, that is operated by an eccentric.